Sleepers Awake served as a good reminder for me: listen first, read later. When you're going through a lot of bands for the next thing that might strike your fancy, it's easy to be swayed by the "recommended if you like" references you get from reviews or self-descriptions. Sleepers Awake has a lot of positive press (as it turns out, deservedly so), but the names of bands they're compared to contained a couple of bands that I flat out don't like. (I'll be polite and not say which ones.) One oft-mentioned band is Tool, who I love, but using them as a RIYL can still be deadly. Bands that are declared to be "the new XYZ," when XYZ is an iconic and unique band, often end up being pale imitations. Think of every awful band that was proclaimed to be the new Led Zeppelin or Black Sabbath, only to go nowhere because their heroes were their whole musical world and they had nothing fresh to offer. When I listened to the first track of Sleepers Awake's album Transcension, I admit it: I thought, "Oh great, they want to be Tool." Chris Thompson has clearly been influenced by Maynard James Keenan, although I think one of Keenan's other projects, A Perfect Circle, is a better comparison, because Sleepers Awake has a lusher sound than the brilliant minimalism of Tool. If I'd turned it off then, though, I would have missed out, because they're not trying to be Tool, or A Perfect Circle, or any other band I could name. You could make a case for how each of their influences comes into play, but in the end, their version of proggy metal is uniquely their own. 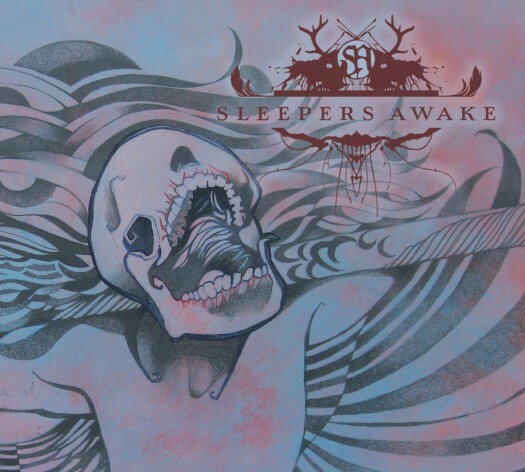 Sleepers Awake isn't as heavy as most bands we review on this site. They use some growling vocals, but for the most part, Thompson sticks to his clean voice. Luckily, it's a very good voice, and he uses genuine emoting instead of the over-the-top theatrics that you get from some prog bands. Everyone in the band is very skilled and very restrained in a similar way. Yes, this album is a 70-minute-long concept album about augurs, who were priests in the Roman era who were charged with interpreting the gods' wills, but the length feels right, and the esoteric content never threatens to overwhelm the music. The songs have a natural flow to them, and at their edges, they blend together into a whole. Saying that songs blend together is often an insult, but in this case, it's a result of stellar song craft. It also doesn't hurt that the guitar riffs and solos from Thompson and Rob Bradley are tasteful and melodic, that Kedar Hiremath knows when the bass can step out with a flourish and when it should be a rhythm instrument, and that Chris Burnsides' drums are tight as can be. I don't know that much about the history or lore of augurs, but I still find myself singing along to these songs anyway. Who is the "chosen rival" they sing about in "Burdened"? It doesn't matter--I still shout along with the words when I'm listening to this in the car. With song titles like "Burdened" and "Saints Condemned," you can get the general sense that the character of "The Augur" is going to face some ups and downs. But even without spelled-out details or a degree in mythology, you can follow the emotional arc, and you can't ask for much more than that. Music has to resonate regardless of lyrical content, and Sleepers Awake achieve that with aplomb.